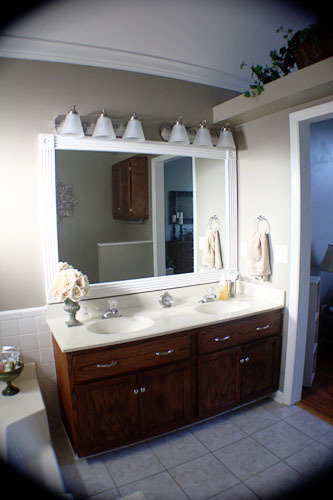 In our old house, I gave our two bathrooms a lot of love. Neither of which are particularly interesting. There’s a reason I haven’t really posted much of our bathroom, and the reason is storage. Specifically, a serious lack thereof. While I made the most of our cabinet space back in the old house, here, we have no drawers and no cabinet storage. Instead... just one little medicine cabinet. It’s large enough to hold Mr. P’s daily grooming essentials and absolutely nothing else. So where does everything else – the first aid, the bathroom cleansers, the hairdryer and curling iron, the barrettes and headbands, the deodorant, the lotions, the sunscreen, the bug spray, the toilet paper, the nail polish, the razors, the travel kits, and I mean EVERYTHING ELSE go? It’s mostly stacked under here. Which I HATE. At least everything is contained in vaguely-organized baskets, but still, it’s not fun shuffling around semi-stacked baskets for a band-aid when you’ve sliced your thumb open (yes, that really happened). 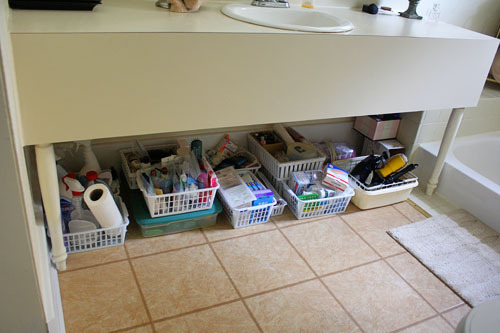 Nor is it fun having all your toiletries on display for the guests to see. 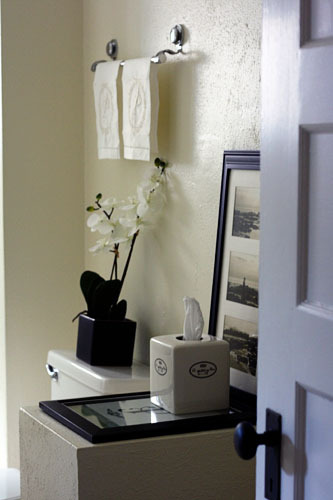 The TP and plunger are oh-so-classily hidden (NOT HIDDEN AT ALL) behind the bathroom door. 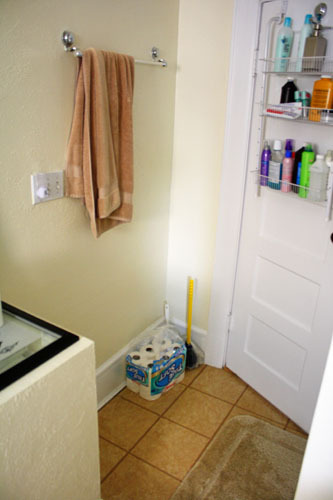 Why bother to straighten Mr. P’s towel if the rest of the bathroom feels so cluttered and messy? And the hooks on that over-the-door caddy (repurposed for holding gift wrap and office supplies in the old house) prevents our old creaky bathroom door from closing all the way. Also classy for guests! 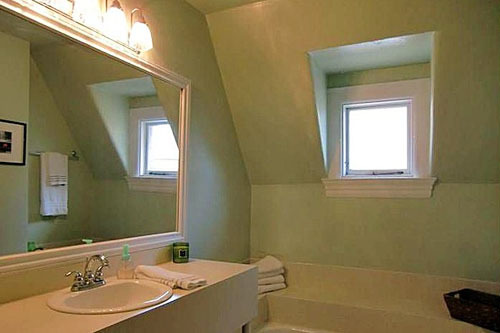 So not only is this bathroom a boring beige box, the function needs some serious improvement. I have ideas, though! 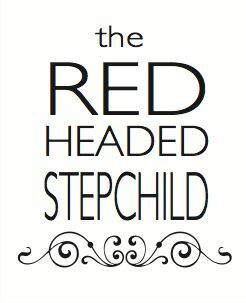 Ideas I will share with you now because of course that’s where this post is going! 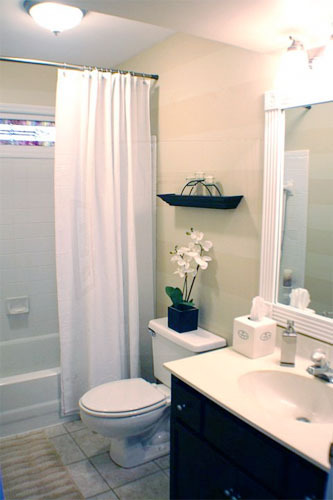 In terms of color scheme, I’m going to work with the beige instead of against it by sticking to the wide neutral palette we had in our old guest bathroom. I think works with the sea of beige if I add in enough black for contrast and interest. It’s rare to find black in a bathroom, especially tastefully done, so that helps make it feel more custom without having to do a single permanent change. But in addition to form, I’ve also got some ideas for function, i.e. storage. I adore ticking stripe and have been looking for a way to include it in our new place. So, I’m going to put it to use hiding our crap under the sink. Time for a counter skirt! 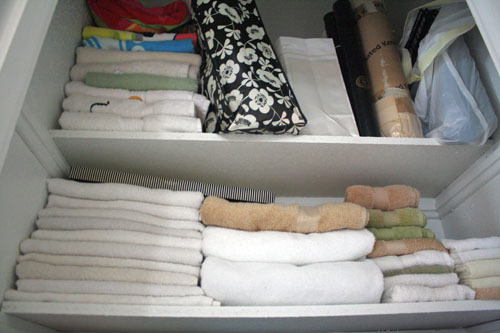 Long long ago, I pinned an image of rolled up towels in baskets serving as shelves in a bathroom, with a note about “Remember this when you’re in a rental with no bathroom storage!” It’s a cute idea, but I’m not going to use the baskets when I can repurpose some shelves I’ve already got (similar to those shown). 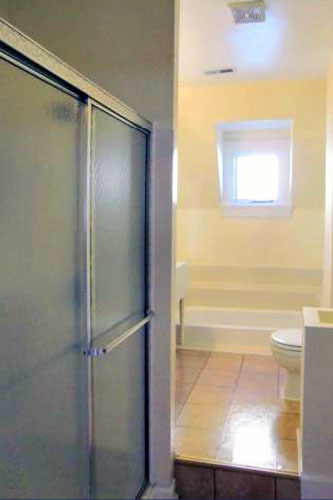 They’ll require a nice coat of oil-rubbed bronze paint, to add another hint of dramatic dark color to the room. Over the months I’ve searched far and wide, and I’ve come to the conclusion that that particular cabinet right there is the only one that fits the space behind the door and my budget. I like that it can totally be repurposed outside a bathroom when we’re out of this place, too. 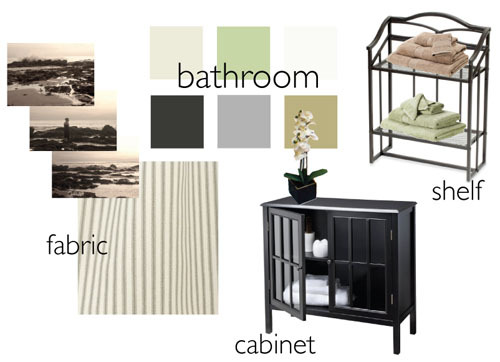 So, those are my current goals for adding some storage space – and a bit of style and character – to the least guest-friendly room in the house! We already have plans for company to come a few more times this year, so hopefully I can get the room in better shape soon. And in the meantime, please reassure me that I am not alone in redecorating our bathroom in the same color palette as our wedding... ?